On the dawn of a new age for mankind, one young woman discovers her passion for the sky, unlike anything she's experienced before. But the journey to discovering her dream faces hardship by the interference of her father, the colony ruler. With the help of her saviour, she embarks on an incredible journey to defy her father and ultimately face mankind's biggest enemy, the Pagers. 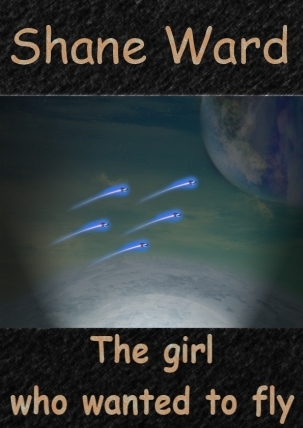 Follow Sonya in her quest as Shane Ward brings you another fantastic new story. A new world waited for us and I was filled with mixed feelings about leaving Earth and all my friends. I studied about the first human to set foot on Lio and I would follow in his footsteps, as did hundreds of hopeful colonists. With the chance to colonise Lio, my family uprooted themselves from Earth and took to the skies in search of new adventures. It wasn't the need to leave a used up world, or escape a civilization that was on the brink of war. Earth was not perfect, but our civilization had learned to live with each other and treat our planet with respect, so why did we head for the vast openness of space? The answer was simple. We yearned to explore the unknown; we wanted a fresh new start in a world. We wanted to see if we could pass on our human ingenuity and passion without spreading the seed of hate. By the time we left Earth, I, Sonya was not a happy girl. The shuttle took off before I could comprehend the choices my family had made. The image of our beautiful world slowly disappeared into the darkness and the starry sky turned all blurry as we travelled faster than light. I knew we were on our way and my family sat with big smiles and overexcited imaginations. They spoke about owning their own land and the opportunities that lay before them; they always spoke about this new world. I was not the only child in this flight. Many families took to the sky on their way to Lio. Such a fitting name; I could have invented something better. But names were not on my mind; I mourned the friends I left behind. I guess I was about eight years old at the time, going through school and enjoying every moment of it. My friends ranged from rowdy young bucks that got into trouble, to the shy adolescent girls that would peek around corners. I, on the other hand, was the adventurous type. I was the one with a goal, which slowly turned into a driving force that convinced me to leave Earth. But I was too young at the time to realize how much I would love this place. As our human intelligence allowed us to adventure into the great unknown, we came upon an alien race that called themselves the Pagers. We never knew what to make of these beings. On the first encounter, which stormed the papers and news services like a storm, the alien vessel sat in space and did nothing for days. I remember seeing it on view-screens back on Lio. Scientists, diplomats, and negotiators tried to communicate with the strange object that looked like a rock with an engine wedged to the top. Not the best design for a ship, but it was different nonetheless. Then it backed away. No reason. It just moved away without any form of contact. As I continued to watch the moment unfold, I sensed something terrible about to happen. I remained glued to the screen as the human vessel attempted to intercept it. This turned out to be a big mistake. The alien vessel opened fire, disintegrating our ship into a million pieces. There was no warning or any need for that blunt attack. The highly skilled teams that had followed all the protocols set out for this kind of situation perished needlessly. It appeared the aliens were in no mood for friendly negotiations and years later, the war began.